The unveiling of the plaque near the crash site. Two pictures at the bottom of this page. Click on one of the links below to visit the video or pictures page. mr. Arie van Eijk added. You can open the story of Lancaster W4690 by G.A.C. Maatje in a PDF document. Click in the link above this text. 561 Aircraft attacked the target. The raid was a partial failure with most of the bombing falling in the north-east of Duisberg. 300 buildings were destroyed with about 180 people killed. W4960 had to abandon the operation. 305 Aircraft attacked the target. Cloud was expected over the target so a Pathfinder technique was planned. This was not expected to give such good results but the plan worked well. 238 crews reported they had bombed Essen. W4960 had to abandon the operation because the rear gunner was sick. 31 aircraft failed to return. 34 aircraft failed to return. 826 Aircraft attacked the target. A very accurate attack took place and nearly 2.000 buildings were destroyed. 599 people were killed. 38 Aircraft failed to return. 759 Aircraft attacked the target. The raid failed with two layers of cloud covering the target. Bombing was very scattered. 50 to 100 buildings were destroyed and 30 people killed. 27 Aircraft failed to return. W4960 had problems on the return journey, the port outer engine caught fire and they came home on 3 engines. The weather was cloudy and Skymarking had to be used. The main bombing scattered. The limited bombing in Essen was mainly in the central and northern districts. 23 Aircrft failed to return. The crew were on this aircraft for this operation but had to abandon due to starboard engine problems. 783 Aircraft attacked the target. This raid was carried out with much accuracy. 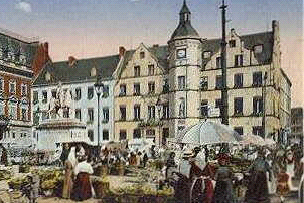 Much of Dusseldorf was destroyed. 1,292 people were killed and 140.000 were bombed out. The crew of W4960 were shot down at 02.05 hours over Reeuwijk/Sluipwijk Holland on the return trip, all seven of the crew were killed. June 11th, 1943, a number of aircrafts took off from the English airfield of Binbrook in Lincolnshire. Among these was the bomber Lancaster W 4960, belonging to the RAAF (Royal Australian Air Force). As it was the tenth sortie against German targets for this crew, they were experienced men in these nightly raids. The aircraft was part of a large Armada of 783 aircrafts, 326 Lancasters, 202 Halifaxes, 143 Wellingtons, 99 Stirlings and 13 Mosquito’s, taken off from various airfields. The purpose of the raid was a heavy bombardment of the German city of Düsseldorf. The targets were to be marked using a so-called ’Pathfinder marking plan’. Unfortunately one of the Mosquito's dropped its ’target indicators’ fourteen miles north east of the actual target. As a result a large number of planes dropped their bombs in open fields. Despite this, the majority of the planes dropped their bombs on the city itself, which was largely destroyed. The attacking planes suffered several losses. 38 planes were lost: 14 Lancasters, 12 Halifaxes, 10 Wellingtons and 2 Stirlings (4.9% of the total amount of planes were to be deplored). On its return journey Lancaster W 4960 was attacked by a German night fighter. The plane was hit and crashed in the Reeuwijk area, the Netherlands. In the early hours of June 12, 1943, at approximately 1.50 a.m. S. Slappendel of the Reeuwijk Air Watch Service reported a large number of aircraft flying east to west across the district. At 2.00 a.m. F. Smit reported “an aircraft is coming down and catching fire in the direction of Grauwkoop”. The inhabitants of the Gravekoopsedijk and surrounding area were roused from their sleep by a low flying aircraft in difficulty. The aircraft tried to make an emergency land-ing after losing an engine (which hit the ground behind the farm of Piet van den Heuvel). 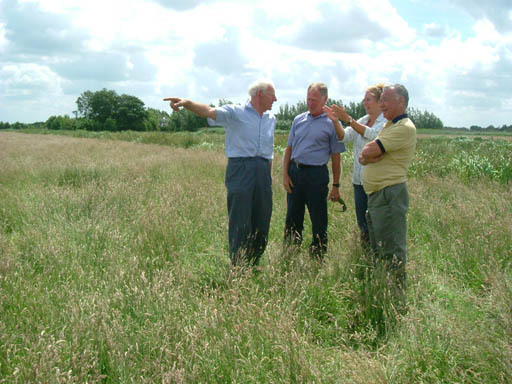 The aircraft, which exploded in mid air, fell in pieces on the land of Piet Rijlaars-dam and Adriaan van Dam, a hundred metres from the Kerfwetering in the direction of Lecksdijk and about halfway between the Gravekoopsedijk and the drive to the farm, nowadays known as Hoeve aan de Kerfwetering. The event created a large disturbance to the usually quiet, slightly remote neighbourhood. The flames from the burning aircraft could be seen many miles around. Up to the present it is not cleared who did inform the German Kommandantur in Gouda (by phone? ), as German soldiers arrived quickly on the scene. At dawn the extent of the accident became clear. In the yard of farmer Van Spengen (Gravekoopsedijk 1) the body of gunner P.J. Hogan was found. He had tried to para-chute to safety but failed due to the low height of the plane. The Bodegraven branch of the Red Cross recovered the bodies, as Reeuwijk did not have such a branch. Ini-tially six bodies were recovered, later on the seventh body was found in the wreck. The crew’s possessions were taken by a Katwijk-based company of the German Wehrmacht. This company had searched the wreckage, too. The Zerlegebetrieb (literally: firm, cutting dead animals to meat!) at Utrecht ordered the wreckage to be recovered on two barges, owned by the Sluipwijk skippers T. and P. van Vliet. They charged the Wehrmacht for ƒ107,92 for labour and lock chamber fees. Afterwards the wreckage was taken by train to Germany to be recycled in the war industry, as aluminium was very scarce in Germany. The Reeuwijk municipality had incurred expenses in removing and burying the airmen, which it very much liked to be reimbursed for. July 13, 1943, the mayor of Reeuwijk charged the Reich on account of costs, advanced by Reeuwijk for burying the airmen. The charges were the supply of three coffins at a total cost of ƒ123,52 and the pur-chase of four coffins delivered by the Firm de Jong from Bodegraven for the amount of ƒ154,00. ƒ58,50 was charged for digging the graves (note: ƒ10,- equals €4,50, £3,60 and Australian $7,70). A separate bill dated July 30, 1943, from the Dutch Red Cross in Bodegraven re-quested “ƒ7,50 for purchasing 25 litres of petrol utilising our licence”. 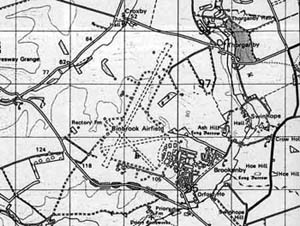 The Reeuwijk records report on this subject as the “…purchase of 25 litres of petrol for transporting the bodies of 7 English airmen from the site of the crash to the cemetery in Sluipwijk.” It seems a bit much, 25 litres for a trip from Bodegraven to Gravekoop and home again via Sluipwijk. Obviously not a very economic car! Reeuwijk transferred the amount, including 6 cents for the clearing form and postage! Only three victims could be identified: P.J. Hogan, J. Heath and R.S. Christie, all from Australia. They were buried as ’unknown airman’ at the church-yard in Sluipwijk (part of the Reeuwijk municipality), together with the unidentified men. A wooden cross was placed on each of the graves, three of which were named. September 16, 1945, deputy-mayor A. Olieman asked the Dutch Red Cross in The Hague if it knew the names of the crew of the crashed aircraft. October 5, 1945, the Information Bureau of the Red Cross at The Hague, sent him the names he had requested for. Apart from P.J. Hogan, J. Heath and R.S. Christie, the crew consisted of the Australians J.H. Horwood and B.W. Bennett, R.L. Lewis from England and R.T. Kerwin, an Englishman from Rhodesia. The missing names were added to the crosses on the unnamed graves. The event at Elfhoeven, however, was so well attended that many neither saw, nor heard anything of what was done and said. For that reason next memorial services were on a smaller scale. The Reeuwijksch Weekblad of May 13, 1949, reports: “At 7.30 p.m. the Mayor and Aldermen, several members of the town-council, the town clerk, the chaplain and several inhabitants gathered outside the Town Hall. The procession marched in silence to the cemetery in Sluipwijk. There several floral tributes were placed on the graves. After the ringing of the church bells, two minutes of silence were observed, after which the procession left the cemetery in silence and returned to its starting point.” The apparently lower public attendance and the absence of music and speeches are remarkable. As already told, inhabitants of the Straatweg (Mr. G.J.J. Valette and others) had taken the initiative to put a memorial stone at the Sluipwijk cemetery to commemorate the seven airmen. It was erected in 1947, bearing the date, June 12, 1943, and the inscription “Fallen for the Liberation”, as well as the names of the 7 airmen. Together with the seven bodies, this stone was taken to the Jonkerbos War Cemetery, where it was temporarily placed nearby the new graves, awaiting the erection of uniform tombstones. 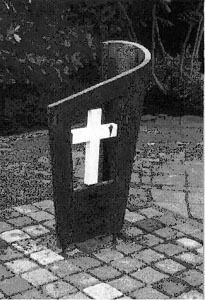 The left picture shows the wooden crosses with the white gravestone in front of them. The right picture shows the gravestone with all the names on it and the wooden crosses behind it. Mr. Valette exchanged letters with some of the deceased’s relatives in Australia. Complying with a request, in 1947 he wrote the Mayor and Aldermen of Reeuwijk about his intention “to plant a nice Australian shrub or bush nearby the graves, as the families have sent me various seeds.” But being none of them “suitable for our climate, according to the Hortulanus [caretaker of a botanic garden] of Leiden University”, Mr. Valette suggested “to plant a nice Dutch shrub or bush” instead, and asked permission to do so. August 12, 1947, the permission was granted and Mr. W. den Ouden was instructed to plant the shrubs. The Commonwealth War Graves Commission requested October 16, 1945, the ’eternal right’ on the seven graves at the Sluipwijk cemetery. 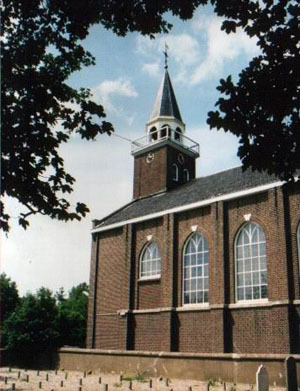 The Mayor and Aldermen of Reeuwijk replied November 4, 1945, that the Sluipwijk cemetery belonged to the Dutch Reformed Church of Sluipwijk and that the board of this church had given these rights to the municipality, subject to certain conditions. “In order to prevent any future difficulties it seems best to us to transfer the seven graves to our public cemetery. This cemetery is the property of the municipality and it is a dignified resting place for our fallen British friends.” says the letter, referring to the public cemetery at the Schinkeldijk, in the hamlet De Tempel. The Commonwealth War Graves Commission thanked the Mayor for his kind offer, but advised that such a proposal would need to be approved by the central board of the commission in London. April 13, 1953, the Mayor and Aldermen of Reeuwijk were informed about the decision of the Commission: the mortal remains were to be trans-ferred to a British War Cemetery, the Jonkerbos War Cemetery at Nijmegen. Monday April 27, 1953, a Mr. McMann was to come to Reeuwijk to make the necessary ar-rangements. 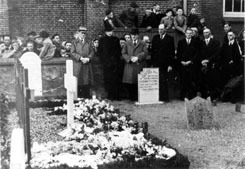 May 4, 1953, Mayor and Aldermen visited the Jonkerbos War Cemetery and laid a wreath on the seven graves, “to give evidence of our honour and gratitude to those who had been fallen for our freedom.” as the local newspaper Nieuwe Reeuwijkse Courant reported, May 8, 1953. After the removal of the memorial stone of the seven airmen to Groesbeek, it was decided to erect a new local War Memorial, nearby the town hall. 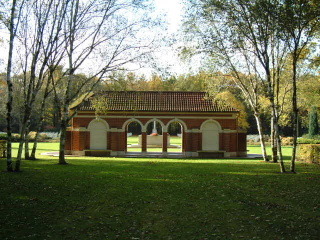 A committee to raise money for building the memorial was founded. Mayor jhr. mr. W.D.H. Quarles van Uf-ford was its chairman. “The monument represents in a simple way an open page from the book of the History of the Dutch People, recording the suffering of the people. About the year 1985 it was necessary to find a new home for the memorial, because of the construction of a new and larger town hall at the open place south of the old town hall, and the old town hall itself being converted into an apartment house. A good site was found at the Dag Hammarskjøldplantsoen, a public garden next to the Thorbeckelaan, on the other side of the Breevaart canal, just opposite to the old town hall. At the end of april 2004 a stone, carrying the names of the Reeuwijk Jews who died in the Nazi annihilation camps, was added. After a year the victims of warfare in the former Netherlands Indies (Indonesia) came along. The area of the public garden provide a suitable background, a quiet place and enough room for the annual memorial service. Since 1985 it has been held there. Based on “ ‘Opdat wij niet vergeten’ - Reeuwijk in de oorlogsjaren 1940-1945 ”, by G.A.F. Maatje; © 2004 gemeente Reeuwijk; pages 50 - 52 and 82 - 83. • Translation: april 2004, made by an unknown person, commissioned by mayor J.C. Bauer. • Original version: booklet, A5-format (lay-out and printing: gemeente Reeuwijk / Frans D. van Wijck). • The original version was handed over by mayor J.C. Bauer to the brothers John and Michael Lewis, during the World War II-commemoration , May 4, 2004. The Lewis brothers are sons of R.L. Lewis, radio operator on the Lancaster W 4960. &# Memorial Dag Hammerskjøldplantsoen: gemeente Reeuwijk. The noise was tremendous and the light from it ,lit his room up like daylight. Apparently the Lancaster circled around twice on fire, he seemed to think the pilot was looking for somewhere to land. It flew very low over the farmhouse, the second time loosing two of its wheels which landed in the rear garden of the farmhouse. 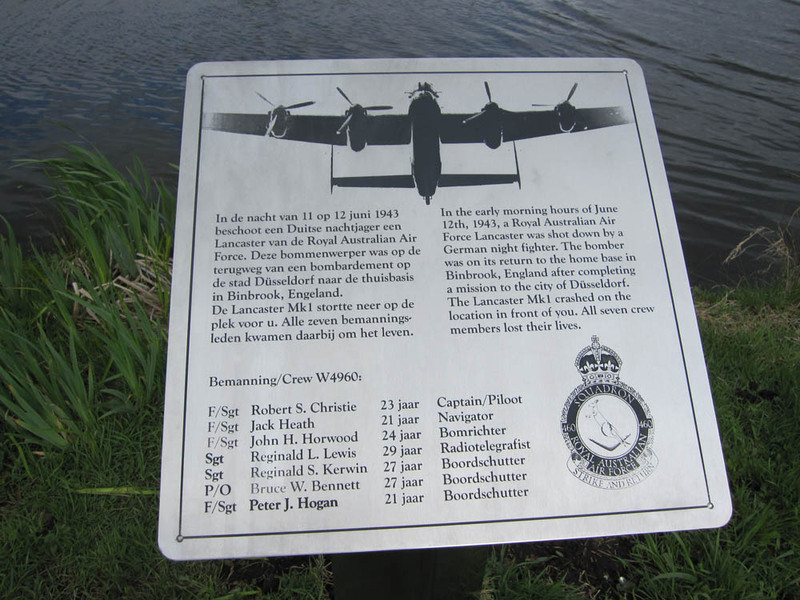 Where there is lake now, it was a field which was some 8 metres lower than some of the other fields in the Lancasters flight pass and because of this unfortunately it clipped some of the trees on the higher ground and blew up. He said the Germans were very quick to appear. An airman was hanging on the electric wires in the lane, with his parachute on, he had survival rations on him. He was later to be identified as being Peter Hogan. The rubber survival dingy was also the found in rear of the farmhouse. He said he had the safety knife from the survival raft for many years. He seemed to want to tell us other things that was on his mind but decided against it and said they were better left unsaid. Mr. van Galen lives next to mr. van de Heuvel and he wanted to know all about the crash. He translated mr. P. van de Heuvel´s (and his sisters) eyewitness story and had send it to wireless operator R.L. Lewis´ son, mr. John Lewis. We talked to him about it a few times, but mr. van de Heuvel said: "wait for my elder sisters to come here, as I was only 7 years when this plane crashed and his elder sisters are up to 10 years older, so they will know more about it and probably also more details. Today, on his birthday, all the elder sisters of mr. van de Heuvel came to Reeuwijk and I (mr. van Galen) took the opportunity to ask them all they know about what happened after the crash. This is what they told me: "It was very late when suddenly the light went off in the farm and also in the surrounding farms. Some of us went out to see what happened and we saw, close to the Gravekoopsedijk, a dead man with a parachute (we are not not sure if it had opened fully), hanging in the electric wires. Close to that place, there was a lot of water on the road whilst the other parts of the road were dry. Later on we found out that a motor from the plane had hit a nearby ditch. After some time the man felt down and we took care of his body and took his identification papers from his chest. Later on, we gave these papers to a mr. van Velzen and a mr. van Waveren, both were members of the Red Cross Society in Bodegraven, that is the next village. The man, who had jumped from the plane and hit the wires. As far as we remember, he was not older than may be 18 years or so. Some people in the area had seen that the plane was burning in the air, just before it crashed, so probably it was hit during a plane fight in the air or by anti-aircraft missiles from the ground. The next day we heard that the plane itself, also with the bodies of about 7 other persons, had been found about 500 metres further on in the fields. All of them were killed immediately during the crash, nobody was found wounded or alive. After a few days they were given an official burial in Sluipwijk (at the graveyard around the old church, still present nowadays). It was very crowded, almost every person from Reeuwijk and Sluipwijk, including our Rev. minister, were present to give them a worthy and decent burial and to honour these young men, who were killed in action while they were fighting to set us free. They have been buried at that site for about 10 years, before they were re-buried at Jonkerbos War Cemetery, Nijmegen. The people in Reeuwijk were not happy with the re-burial, for they felt that these bodies should stay in Sluipwijk, we were proud to take care of these graves. We remember that they all had a tombstone with their own name written on it, but we have no idea what happened to the tombstones after the re-burial. Most of the remaining parts of the plane were, soon afterwards, taken away from the site of the crash, by a local scrap and iron company. But we think that some very heavy parts e.g. an engine, are still present, deep in the mud. At least some of the guns of the plane plus thousands of bullets were found near the plane by some farmers and all that was handed over to the Dutch resistance. This is all we remember of that crash. We are still grateful for the sacrifice, that they and so many others made during the war. They paid the highest price for our freedom and we will remember that forever". Crash area near Sluipwijk, The Netherlands. This picture and the one below were shot in June 2008. 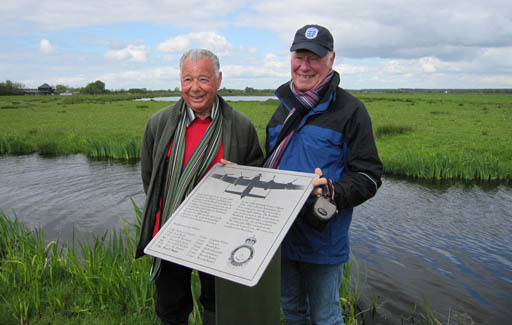 Pointing out where the Lancaster W4960 crashed. 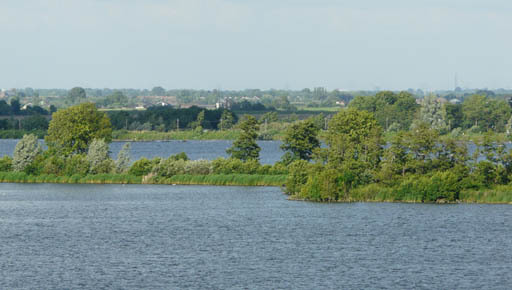 This picture (and the one below) were taken from the church tower in Sluipwijk. The Lancaster W4960 crashed a short distance away from the church. My name is Arie van Eijk, I was born in 1931 and I was a boy of about 12 years old when the Lancaster W4960, crashed in 1943, close to the farm of my parents on the Gravekoopsedijk. During the night of 11th to 12th June, 1943 quite some people heard the plane circling for quite some time, before it came down and crashed. The first thing I saw the next morning was the body of a very young man, it seemed. Later on we heard that it was the body of mr. Peter Hogan. Unfortunately he was already dead, laying on the ground, just under the electric wires and near a ditch, close to the Gravekoopsedijk. There was a big wound in his back. His parachute was laying in the field, more than a kilometre away from his body. To my conviction, he must have died already in the air, probably when he was hit by a bullet, most likely from the German anti-aircraft defence system. We also found some parts of the plane, two airguns, a big wheel, and a petrol tank, all close to the road in one of the grass fields of my father. Also two engines had come down, they were separated from the plane and created a very deep hole in the soft soil of the grassland. One of these engines was later on removed from the burst in the field, but the other engine is definitely still resting somewhere under the surface of the field. Finally a small suitcase was detected behind the farm of mr. van Spengen. One air machine-gun was handed over to the Dutch resistance, the other one exploded(!) when some boys (my brother Leendert, Jaap van den Heuvel and I) took it along and experimented a bit with it, we were using some fire, while we were playing with a bit of the gun powder and some of the bullets, that we had found close to these airguns. The plane itself crashed close to the lake, there was more or less a straight line from the place where the parachute came down, along the loose parts and the body of mr. Hogan to the spot where the plane finally crashed. 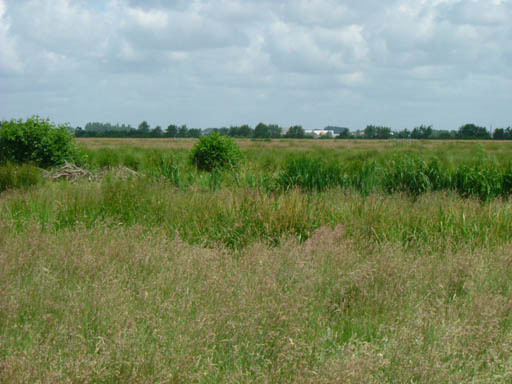 The plane came down on the land, owned by a mr. Piet Rijlaarsdam. 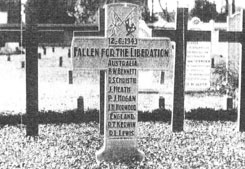 The corpses of the other crewmembers were all found near or under the wreck and were recovered under the supervision of the Germans by a local company. One of the Germans once said to us that it would have been better from his point of view, if the plane would have crashed inside the lake in stead of on the land, close to the shore of the lake, for now they had to see to it that the remaining parts of the plane were removed from the soft boggy ground, the peaty soil. I am very glad that I had the opportunity to point out the exact place of the crash to the two sons of mr. Lewis, in June 2008. I am also happy that a memorial stone is erected in 2008, 65 years after the crash of W4960. This will help us to remember the crew and as long as we live, we will never forget the great sacrifice they made for our freedom. The plaque that was erected on may 5th, 2010 near the crashsite. Click here to watch a 13 min move about the ceremony.